This attachable bun headpiece can be used to create the look of a bun when you have shorter hair or are unable to put your hair up into a bun. The attachable bun comes in a wide range of colors. For a unique look choose a color that contrasts your own natural hair color. 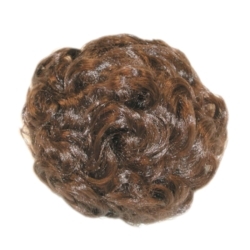 The attachable bun hairpiece is one size fits all using attached hair clips.